The SPFL— the case for revolution, evolution and a case of the Hamilton Whackies ! As we ponder the historic vote to create a new Governing body to oversee Scottish League football, I cannot help but wonder what brilliant minds will be employed in the drawing up of its constitution, rules, memorandum and articles of association? Clearly, Messrs Doncaster, Longmuir and even Mr Regan as the CEO of the SFA will be spending many hours with those dreaded folk known simply as “ The Lawyers” in an attempt to get the whole thing up and running and written down in the course of a few short weeks. In truth, that scares me. It scares me because legal documentation written up in a hurry or in a rush is seldom perfect and often needs amendment—especially when the errors start to show! The old adage of beware of the busy fool sadly applies. It also scares me because the existing rules under which the game is governed are not, in my humble opinion, particularly well written and seem to differ in certain material respects from those of UEFA. Even then, adopting the wording and the approach of other bodies is not necessarily the way to go. I am all in favour of some original thought– and that most precious and unusual of commodities known as common sense and plain English. Further, the various licensing and compliance rules are clearly in need of an overhaul as they have of late produced what can only be best described as a lack of clarity when studied for the purposes of interpretation. Either that or those doing the studying and interpreting are afflicted with what might be described as tortuous or even tortured legal and administrative minds. If it is not by now clear that the notion of self-certification on financial and other essential disclosure criteria necessary to obtain a footballing licence (whether European or domestic) is a total non-starter — then those in charge of the game are truly bonkers. Whilst no governing body can wholly control the actions of a member club, or those who run a club, surely provisions can be inserted into any constitution or set of rules that allows and brings about greater vigilance and scrutiny than we have at present—all of course designed to do nothing other than alert the authorities as early as possible if matters are not being conducted properly or fairly. However, the main change that would make a difference to most of the folk involved in the Scottish game – namely the fans— would be to have the new rules incorporate a measure which allowed football fans themselves to be represented on any executive or committee. Clearly, this would be a somewhat revolutionary step and would be fought against tooth and nail by some for no reason other than that it has simply not been done before—especially as the league body is there to regulate the affairs of a number of limited companies all of whom have shareholders to account to and the clubs themselves would presumably be the shareholders in the new SPFL Ltd.
Then again to my knowledge Neil Doncaster is not a shareholder in The SPL ltd– is he? I can hear the argument that a fan representative on a league body might not be impartial, might be unprofessional, might be biased, might lack knowledge or experience, and have their own agenda and so on—just like many chairmen and chief executive officers who already sit on the committees of the existing league bodies. Remember too that the SFA until relatively recently had disciplinary committees made up almost exclusively of referees. I don’t think anyone would argue that the widening of the make up of that committee has been a backward step. However, we already have fan representation at clubs like St Mirren and Motherwell, and of course there has been an established Tartan Army body for some time now. Clubs other than the two mentioned above have mechanisms whereby they communicate and consult with fans, although they stop short of full fan participation– very often for supposedly insurmountable legal reasons. As often as not, the fans want a say in the running of their club, but also want to be able to make representations to the governing bodies via their club. So why not include the fans directly in the new set up for governing the league? Any fan representative could be someone proposed by a properly registered fan body such as through official supporters clubs, or could be seconded by the clubs acting in concert with their supporters clubs. Perhaps a committee of fan representatives could be created, with such a committee having a representative on the various committees of the new league body. In this way, there would be a fan who could report back to the fan committee and who could represent the interests of the ordinary fan in the street in any of the committees. Equally such a committee of fans could ensure that any behind the scenes discussions on any issue were properly reported, openly discussed, and made public with no fear of hidden agendas, secret meetings, and secret collusive agreements and so forth. Is any of that unreasonable? Surely many companies consider the views of their biggest customer? This idea is no different. Surely such a situation would go some way towards establishing some badly needed trust between the governing bodies and the fans themselves? If necessary, I would not even object to the fan representatives being excluded from having a right to vote on certain matters—as long as they had a full right of audience and a full right of access to all discussions and relative papers which affect the running of the game. In this way at least there would be openness and transparency. In short, it would be a move towards what is quaintly referred to as Democracy. Perhaps, those who run the game at present should consider the life and times of the late great Alexander Hamilton- one of the founding fathers of the United States of America and who played a significant role in helping write the constitution of that country. Hamilton was a decent and brilliant man in many ways—but he was dead set against Democracy and the liberation of rights for the masses. In fact, he stated that the best that can be hoped for the mass populace is that they be properly armed with a gun and so able to protect themselves against injustice! Sadly, Hamilton became embroiled in a bitter dispute with the then Vice President of the nation Aaron Burr in July 1804. Hamilton had used his influence and ensured that Burr lost the election to become Governor of New York and had made some withering attacks on the Vice President’s character. When he refused to apologise, the Vice President took a whacky notion and challenged him to a duel! Even more whacky is the fact that Hamilton accepted the challenge and so the contest took place at Weehawken New Jersey on the morning of 11th July 1804. The night before, Hamilton wrote a letter which heavily suggested that he would contrive to miss Burr with his shot, and indeed when the pistols fired Hamilton’s bullet struck a branch immediately above Burr’s head. However, he did not follow the proper procedure for duelling which required a warning from the duellist that they are going to throw their shot away. Hamilton gave no such indication despite the terms of his letter and despite his shot clearly missing his opponent. Burr however fired and hit Hamilton in the lower abdomen with the result that the former secretary to the treasury and founding father of the constitution died at 2pm on the twelfth of July. The incident ruined Burr’s career (whilst duelling was still technically legal in New jersey, it had already been outlawed in various other states). In any event, in Hamilton’s time full and open democracy in the United States of America would have met with many cries of outrage and bitter opposition. Yet, today, the descendants of slaves and everyone from all social standings, all ethnic minorities and every social background has the constitutional right to vote and seek entry to corridors of power. In that light, is it really asking too much to allow football fans to have a say and a presence in the running of a game they pay so much to support? Fook helps glue many companies to Rizvi, Morgan, Stockbridge and even Green …. Nova Resources, Orlit … the list continues …..
To see how close he is to Rizvi ….. he is the protector of his family trust …. loaded just around the time that Rizvi had to urgently squirrel his monies away as the authorities pounced …..
As for the Hart connection ….. have not followed that on through ! http://opencorporates.com/companies/gb/SC109648 The relationship appears to go back a long way…..
Nova’s parent company is BVI registered Total International Investments Limited. Hoodless Brennan ….. that’s it …. thought it was eco …. 100bjd another great bloodhound ! You know what guys …. if we can find the SDM connection … !!! Wild rumours or the truth???? THE rangers in admin?????? PMG will be first to flag …. What’s more preferable, admin or status quo? 2. Daniel Stewart & Co. Ltd – Nominated advisors and brokers : David Hart/James Felix. Is this ‘Hart’ the same one that’s just been appointed to the Ranger’s board. Ian Hart the RIFC Plc director has been on the Board since the company was formed last year and was previously a member of the Blue Knights and prior to that had a long term interest in promoting youth development at Ibrox. He is a retired Scottish businessman and I’m not aware of any connection with David Hart although haven’t checked it. I have always been more interested in Mr Hart’s shareholding in RIFC Plc and the strange confusion over how he apparently became involved as one of Charles Green’s original investing consortium. On a more upbeat note: On holiday in Sweden with the family (cabin with clockwork internet) and just ordered four tickets in the family section for Malmø v Hibs. Everyone looking forward to the match, especially my two teenagers. Bless Rangers, the Glasgow football club, for coming up with an altogether fresh approach to the governance of listed companies. Since floating on Aim in December at 70p a share, apart from losing more than a quarter of its value, it has lost its chief executive, and as of last week its chairman and Phil Cartmell, one of the non-executive directors on the six-man board. Mr Cartmell has been replaced by local businessman and bus operator James Easdale. A perusal of Companies House entries suggests that now just one of the Rangers’ non-executives has significant experience as a main board director of a listed UK company. Gers has also replaced Cenkos as nomad and broker. A spokesman says “it was time for a fresh approach”. Small Talk has seen staler fish at the supermarket. Nae fair … the original Furious Four were recently out for a few gigs and by all accounts were back to their late 70s/early 80s best (when they really were a stupendous live band). 🙂 Unfortunately, they’ve now regrouped with the rubbish rhythm section of more modern (marguerita) times. I haven´t sight of newspaper. Is that part of an article or a comment from a reader (NewGers) ? A board spokesman said the open letter did not warrant a response because of certain inaccuracies. But he added the non-executive director Bryan Smart had a string of directorships to his name, while finance director Brian Stockbridge had been a nominated adviser throughout his career. “It is very clear that the board is now settled. It is a united board looking forward to delivering the five-year plan to get the club back to the top of Scottish football again,” the spokesman said. Just to say I don’t really feel I have the abilities or techie nous to contribute to the current investigations, but I am following avidly. All power to your keyboards guys and gals. Go get em! They didn’t plunge into the bottom tier, they climbed there. With a lot of help from their friends. From the FT article, I don’t get the reference to “staler fish”. If it’s meant to be a dig at RIFC then how is comparing them to a product that is worse than them relevant (working on the premise that supermarket fish are pretty fresh) or is she trying to be smart and suggesting that something fishy is going on. Gaz – as I say, I was quoting the article. I know, you know, we on TSFM all know how they got there. I think she was having a go at the “fresh approach” comment and didn’t really think it through properly. Thank´s but who said what is quoted in JB´s post of 10:04 ? Could you or other please c&p the article in full. Seriously, I have every sympathy but would encourage posters and lurkers to stay onboard. The slow assimilation of information may eventually provide for an emerging picture. I was sure I was well adrift of the business links discussion but when I read newtz mega post the other day I understood virtually every word. Even though I didn’t have all the facts, I had aquired enough knowledge for his solution to make sense. As ecobhoy said yesterday, you never know what little snippet of recollection or information is going to bridge the gap between previously dispirit facts. If we hang in whilst the guys that like to specialise in this kind of stuff range far and wide, we will all have that fuller knowledge that will allow the ‘truth’ to get out into the wider world. I recall when Sam first started posting I was more than sceptical about his motives (call me paranoid): Long scripts of business information without any context or a link to its source. I thought it was clogging up the blog. It now appears he has been dropping in essential ingredients of the recipe. I realise that, and sorry if I came across as if you were saying it. There has been a constant stream of propaganda since Rangers failed to achieve a CVA and were placed into liquidation, with this new club being formed at the same time. It only takes for us to ignore that and history will be re-written. Rangers did not plunge anywhere, they are being liquidated. Sorry, got my quotes mixed up. If the quote is this- ““His departure is fuelling fears that Rangers is once again entering a period of instability of the kind that led to its administration and liquidation last year and its plunge into the bottom tier of the Scottish game.” then that is from the body of the article, written by Roger Blitz, the FT Leisure Industry correspondent. Apologies for any confusion caused. Rangers’ new board has hit back at warnings from its ousted chairman that the Scottish football club now lacked corporate experience and risked returning to the dark days of financial secrecy. Malcolm Murray left the board last week, along with fellow non-executive director Phil Cartmell, telling fans of the one-time giants of Scottish football that they deserved a club “run by men of the highest integrity and global commercial ability and the highest level of transparency”. His departure is fuelling fears that Rangers is once again entering a period of instability of the kind that led to its administration and liquidation last year and its plunge into the bottom tier of the Scottish game. Mr Murray was brought in as chairman a year ago following the takeover orchestrated by Charles Green. The club floated on Aim in December, but Mr Green quit as chief executive in April over alleged links with former owner Craig Whyte. Boardroom tension prompted Mr Murray to stand down as chairman in May though he retained a seat on the board until last Tuesday. The board now includes James Easdale, who runs a bus company and holds a small stake in the club with his brother. They are expected to buy the 8 per cent shareholding of Mr Green when he is able to sell it later in the year. Mr Murray said of his own expertise that he had been recommended to the role by institutional investors, and drew attention to his stewardship of a 25 per cent stake in Manchester United. He is director of MWB Business Exchange. Mr Murray said institutional investors were bound to question the loss of board members such as himself and Mr Cartmell, who have experience of public companies, as well as the board’s decision to bring in new brokers. “Only time will tell how they will react. These investors and you are our future and you must be listened to and given transparency,” said Mr Murray. Charles Green brought Malcolm Murray in because he was an experienced businessman, well connected in financial circles and a lifelong Rangers supporter. Just the man to lead the business through a floatation on AIM. Ironically he got rid of him for exactly the same reasons. He really didn’t want an experienced businessman with Rangers’ best interests at heart running his club. I meant to say, when the Easdales buy Green’s 8% it must be a distinct possibility that they will also buy the 2.2% owned by Ahmad and the 2.2% owned by Richard Hughes (Zeus). Making a healthy profit for all three men, and giving the Easdales 12.5% to add to what they already own. The connection to Murray and Whyte was established long ago on RTC. Just cannot recall the various posts but I posted that it was inconceivable that Murry would not know Whyte. Whyte is married to the daughter of Hugh Martin who owned the family steel firm of Martins Dundyvan in Coatbridge which produced rolled steel beams.Where did Murray buy his steel? Gillespie owned JW Soils in Plains which operated open cast mines in Plains/Greengairs and Fife when they got into bed with Murray and became GM Mining. As for certain people buying share in “The Rangers” it should be remembered that they are buying shares in a publicly quoted company which happens to operate “the Rangers”. This company will own nothing in terms of property if Whytes claims are true, and I believe they are, which leaves the shareholders with what, “The Rangers”. Will they continue to operate it and rent Ibrox and Murray Park? This has a long way to run. In my opinion the only thing that is missing is the tapes which would prove Murray set the whole thing up. I wonder if Mr.Blitz may care to look more closely at Brian Stockbridge ? The Newtz spreadsheet shows that he worked with Imran at Allenby, which came under the Merchant House Group. Would any of the investigators care to compile a small profile of BS ? His business past, how it may have been linked to those who may be currently involved either directly or indirectly, his current role and how he may or could use it. Plus any thoughts on him going forward ? We note the contents of your email below. As explained in our acknowledgment to your first e-mail of 24 June 2013, we investigate all allegations of breaches of the AIM Rules but for reasons of confidentiality we are unable to provide you with an update on how we might consider matters. You will appreciate that confidentiality is essential in maintaining the integrity of our work. This company (RIFC PLC) disclosed in its admission document financial information for the period to 31 August 2012. It is surely undeniable that under Rule 18, the company is required to prepare a half-yearly report to 28 February 2013. Or are you in fact denying that Rule 18 requires such a report? If so, please explain to me in simple terms how the very clear requirements of Rule 18 have been complied with in this case. I am, of course aware that the company produced interim accounts for the period to 31 December 2012. Accounts to 31 December 2012 do not meet the requirements of Rule 18. A company can produce accounts monthly or even weekly if it so chooses. But this company can only comply with Rule 18 by preparing a report to 28 February 2013. The whole point of Rule 18 is to ensure that investors receive reports at 6 monthly intervals, no longer. In this particular case, you seem relaxed about the company not submitting any report to shareholders for over 9 months, since the annual accounts to 30 June 2013 do not have to be published until 31 December. That is, I have to say, a completely unacceptable position.It cannot be open to a company listed on any regulated market just to determine its own timetable for publication, in clear contravention of the market’s published rules. You are responsible for ensuring that companies listed on the AIM market comply with the rules of that market. I have highlighted a clear breach of those rules by a member company. I want to know what you propose doing to enforce the rules. In the event that I suffer financial loss as a result of this clear compliance failure, I can assure you that I will be seeking legal advice- and advising others affected to do likewise. Looks like I’ve hit the buffers, but if I decide to reply, I’ll post it here. This is the only place I check on matters relating to Scottish Football and my only remaining interest in it. It’s up to this site and its posters to be the rain that Travis Bickle alludes too. I hope the SFA are monitoring the Scottish Football Monitor. We are all on the Titanic but the guys steering at the SFA had better be listening to the lookouts searching the horizon for the various icebergs lying in the path of the good ship Scottish football as they have a duty of care to the passengers as well as themselves. What icebergs do we lookouts see in the water? 1. The ownership of the Rangers is a glacier that splits into a number of ship killers. a) Does the nature of the IPO invalidate the “sale” in the first place. What would the impact of that be on our game and what steps could be taken to avoid? b) If IPO ok does CW have a claim on The Rangers and if so what is the SFA position on this eventuality? c) Do SFA know the source of the funding that is keeping The Rangers head above water and if it turns out to be disreputable what is their position? d) Do SFA know if the Rangers declared income is coming from football related sources? How do they know?What are they doing to make clubs prove what they tell them is in fact true? e) What is their position on the UEFA 2011 licence which WAS an overdue payable and during which process the failed to make Rangers prove to them that what the SFA were being told was the truth, resulting in lies that the SFA told the football supporting public just as the SFA were publishing their 20/20 Vision were they claimed to be trusted and respected? Folk can add to the iceberg list but if the guys steering think they can negotiate safe passage and come out the other end they would do well to remember it is not the top one ninth of the iceberg that sunk the Titanic but the eight ninths below the surface. It is time for the sake of our game the folk at the wheel started to change course and tell the passengers. It is also high time msm journalists worth their salt started asking the same questions. Yea. Please keep up the good work. This site helps me through the day. Due to ill health,I have time to follow this blog and have read almost all comments since RTC times. You give me hope that us fans will win and without hope,what have we? I previously posted AIM’s reply to my first and second email’s. This is the reply I made in my third email of 9th July. Thank you. I am obliged to you. Not seeking any response, I may say that the bitter in-fighting of the Directors ( more resignations and appointments than you could shake a fist at) and the withdrawal of both NOMAD/Broker Cenkos AND their supposed replacement Daniel Stewart Plc , together with the apparently lunatic management of the Company, have convinced me that , if there is no actual rule-breaking, there is a less than upfront honesty about how the business is being conducted. Some even think that an insolvency event may be in view. Between you and me, not a company I would invest in! Their reply, of course, was just to acknowledge receipt. More generally, I got back very late from London last night, and spent a while reading myself up-to-date on the blog. Some very good stuff, that makes me hopeful that a full narrative of how everything connects might be written sooner rather than later. Interestingly, on my journey back from London I fell into conversation with a chap ( a banker, he said) who appeared not to know too much about the RFC(IL)/ RIFC saga. I enjoyed enlightening him, carefully separating out what is factually known for sure, from what is speculatively being deduced from the the facts in relation to the many linkages to personnel in the questionable end of the business and legal spectrum. He was really quite interested at the mention of the Rizvi/ interpol connection, and I could almost see his banking brain getting to grips with the potential implications for directors etc who might conceivably be facilitating the business activities of such a person. The man I was speaking to is not a Scotsman, has not been many weeks in Scotland, but he knew of the general malaise in the footballing world in respect of the English clubs that have been and are in financial difficulties. So I don’t think he mentally dismissed me as a crank. But I really enjoyed proselytising in the name of truth on what would otherwise have been a boring trip! A vessel’s stability is not necessarily breached at the point its watertight integrity is compromised. The hole below the waterline is just the beginning of a process of destabilisation. As the ingress of water escalates the crew will take desperate measures to isolate the damaged section of hull by securing doors: They will set pumps in motion to displace the incoming fluid. Only time will tell if the breech is too significant to avoid ultimate catastrophe. The damage may therefore already have been done. We know there is at least one crisis management process underway. When unprecedented events are encountered it is more by luck than judgement that its victims escape an ignominious fate. When you see a mighty vessel at sea it is easy to believe that it borders upon invincibility. However it is only great skill and a thorough knowledge of the rules of seamanship that ensure the safety of everyone onboard. With every risk that is taken the margin for error decreases. In a culture that has become unable to recognise its own risky behaviour there is every likelihood that invisible lines will be crossed. 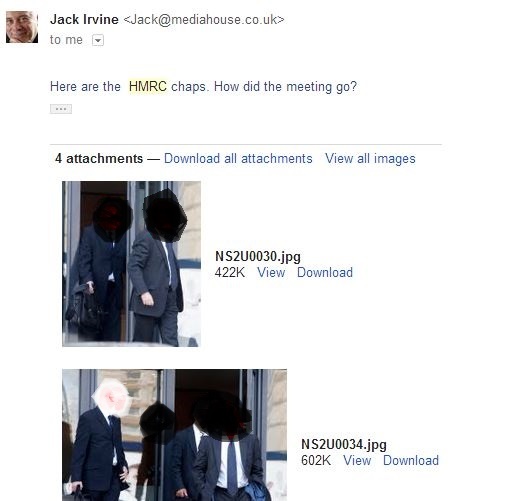 @JackIrvine @George_Osborne @Cayman_Islands @tom_watson Jack, tell us more about You, Rangers and the secret photographs of HMRC officials. Big problems with the site tonight folks – caused by some silly attempts at DoS. This one easy enough to deal with, but I fear there may be more. In case of a repeat, I will prepare a vanilla front page with a link to the old site so we can continue to have our discussion. Welcome back TSFM. Had us all worried there. What’s DoS, and do you think the “silliness” of which you speak might be indicative of how dangerously close the intrepid bampots are to exposing the whole shooting match? @JackIrvine @George_Osborne @Cayman_Islands @tom_watson Here’s Jack stalking HMRC. Intimidating and worrying. @JackIrvine @George_Osborne @Cayman_Islands @tom_watson Simple Question Jack, Are you responsible and why? DoS is an outside attempt at Denial of Service. Basically there is a co-ordinated scheme to request several hundred thousand pages from our server simultaneously, which causes the computer our site is on fall over with exhaustion. We have also been subjected to script injection attacks on our database (be assured no personal details of subscribers are held on the database) which, although unsuccessful, caused the database to hang, which required some fixing. A DoS (Denial of Service) attack is quite a common event usually perputated against a target site by somebody (or people) who take exception to what is being published on the target site. There are several methods of attack but the objective is quite simply to deny you, and all the others who populate TSFM, the ability to converse and exchange ideas and opinion. It is in effect petulant electronic censorship. I think that under laws passed in 2006 Dos attacks are now viewed as a crime punishable by up to ten years in jail. I’m happy to be corrected, or have that confirmed, by somebody more qualified in the field than I. If the sentence was indeed ten years that would be an unfortunate number of life’s journeys one could conceivably miss out on. Thanks for that TSFM, and congratulations on identifying and fixing the problem. You (we) certainly seem to have someone rattled. Thanks also to kitalba.